Caro’s Book of Poker Tells is one of the most read and widely loved poker books of all time. It even appears in the first scene of the poker film rounders alongside Doyle Brunson’s, SuperSystem. Mike Caro is well known as ‘the mad genius of poker’ and not just because of his crazy sticky out hair style but also because of his amazing talent for reading players body language and tells and being able to explain how he does it as well as many other mathematical genius theories. Mike Caro has written of 13 books and holds seminars in which he teaches aspiring players how to use the knowledge that he’s gained over the years. Caro’s most famous poker book, The Book of Poker Tells starts with an introduction and then explains his well known MCU poker charts. The rest of the book is split into four sections, these sections will tell you the different kind of states in which poker players give off poker tells which reveal the cards in their hands. ‘Tells From Those Who Are Unaware’, ‘Tells from Actors‘, ‘Some General Tells‘ and ‘The sounds of Tells‘ are the four sections in the book. All the tells that are talked about in these section have photo’s and text to make it easy to understand what you should be looking for at the poker table. It can also give you an insight into what you shouldn’t be doing if you don’t want your opponents to pick up your tells! 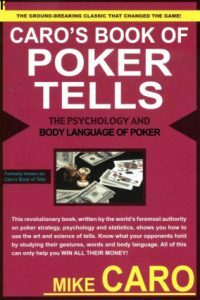 The book also gives you information to help you categorise the Poker Tells and explains why your opponents (or indeed you) give off these tells. Caro’s book of Poker Tells also has estimates of each tells reliability and the value of the tells per hour. We don’t really believe these estimations to be correct especially the ones stating that the tell is 97% reliable. You shouldn’t let that put you off buying the book though as the rest of it is extremely insightful and many of the tells you will learn about will help you in other aspects of life. At the end of the book there is a quiz to test you on your new found ‘tell’ knowledge, this is a really good extra feature as it will help you to really remember all that you’ve learned in the book and highlight what you need to go back and read again. If you like to play live poker or are considering it whether it be at a home game, in the casino or at the WSOP hehe, we highly recommend this book to you. There are very very few other poker books that talk about tells and none are even close to being as good as Caro’s Poker Book of Tells.